The Royal Penthouse ... panoramic views. The Middle East has just got its first Edition Hotel in Abu Dhabi. The iconic luxury property celebrates innovative design while respecting traditional Emirati culture. The opening of this brand - a collaboration between Schrager and Marriott International – at an exclusive waterfront setting in Abu Dhabi, UAE, offers a distinctive, upscale environment, encompassing innovative design whilst respecting and celebrating the lifestyle and traditions of the Emirati culture. With 198 guest rooms and suites as well as 57 exclusive residences, Edition combines exceptional design and innovation with personal, friendly, modern five-star service as well as outstanding, one-of-a-kind food, beverage and entertainment offerings ‘all under one roof’. The Abu Dhabi Edition in the new Al Bateen Marina area ... a Middle East first. 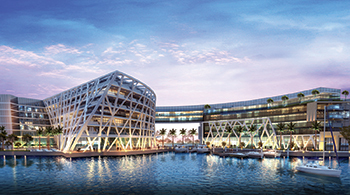 A single, iconic gem located on a prime site on the Al Bateen peninsula, 20 minutes from the Louvre Abu Dhabi and the beaches of Saadiyat, and just 35 minutes from Yas Island, the property enjoys breath-taking views of the azure waters of the Arabian Gulf and the activity of the buzzing adjacent marina. Edition’s collaborative aesthetic is in its approach to the modern lifestyle, seeking out the most talented individuals, from artists and designers to world-class chefs and musicians to create a new, experience-led destination for Abu Dhabi. The Abu Dhabi Edition is not merely a hotel, but an elegantly designed, intricately interlinked complex of structures, spaces, and settings that together offer a new kind of resort environment, where every aspect of the traditional hotel has been re-imagined for the needs and desires of a new generation and for enhancing a guest’s stay: for leisure and for work. Embracing the local architectural heritage of the eastern tip of the Arabian Peninsula, the hotel blends the form and details of traditional architecture as well as natural local patterns that are the inspiration for the materials, colour palettes and details that feature throughout the hotel. Strategically situated along the marina, the view on arrival is the distinctive and memorable exterior, reminiscent of the lateen sails of the traditional dhows that the region was once famed for building. Market at Edition ... the magic of an open kitchen restaurant. Designed throughout by Ian Schrager Company and Wimberly Interiors, the cavernous five-storey lobby contains a dramatic, curved atrium with a sinuously shaped balustrade, echoing the movement of the water and mirroring the marine narrative of the development. The exceptional lounge area, ubiquitous with all Edition hotels, features a large-scale kinetic art installation In 20 Steps designed by the renowned art collective Studio Drift, produced by Czech glass company, Lasvit. The installation pays tribute to evolution and humanity’s desire to fly, spanning across the whole length of the space above the lounge and is made from a number of glass cylinders, each connected by metal joints and suspended from the ceiling by a series of strings that enable the artwork to move. Below, the vast lobby contains two signature armchairs by local designer, Latifa Saeed, inspired by the distinctive way Emirati children braid their hair. The guest reception is flanked by a feature, brass-clad desk and the surrounding walls are ensconced with gold leaf, gently washed with a delicate light to create a sense of superior warmth and welcome to guests. The lobby is a place for guests and visitors alike to relax and unwind: here, there are both group meeting tables and a signature golden Edition pool table, a world-class bar and an expert barista station. With distinct seating areas separated by bronze screens, inspired by traditional Arabian architectural techniques, guests can lounge in the serene space whilst enjoying an invigorating, signature punch, or an indulgent afternoon tea treat. Heightened dining experiences are fundamental to Edition hotels and The Abu Dhabi Edition is no exception, with three signature restaurants created by world-renowned chef Tom Aikens, famed for being the youngest chef to ever have been awarded two Michelin stars. 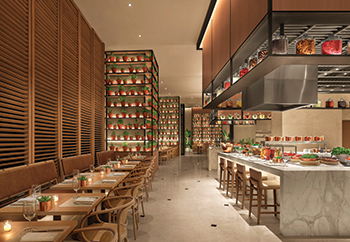 Just off the lobby is Market at Edition, an imaginative, healthy lifestyle restaurant whose relaxed and interactive style and light, airy interior blurs the boundaries of traditional and al-fresco dining. Each kitchen features floor-to-ceiling shelves dressed with fragrant pots of herbs and traditional copper kitchen accessories. The planted terrace encourage guests to linger outdoors and enjoy the Market atmosphere and a private dining room with its own private entry is available for hire for larger groups, also with direct elevator access to the penthouses and a secure basement garage. The Abu Dhabi Edition is also home to Oak Room, a traditional English oak-panelled restaurant, celebrating world-class ingredients with British rock ‘n’ roll flair. Here, theatre is not saved for the kitchen – as seen in the Market at Edition. It is constantly on show, with a frosted glass-fronted butchery to enhance the diner’s senses and assert the importance of the restaurant’s quality produce. Opposite the entrance to Oak Room, the secluded sophistication of Library Bar awaits. Taking design cues from its own name, the space features a collection of artworks that draw upon themes of language and the written word, in all of its marvelous literary forms. Over on the marina side of the hotel, Aikens has created a serene, coastal Mediterranean-style restaurant, Alba Terrace, where natural sunlight streams into the space through the folding floor-to-ceiling glass doors. A crisp, light colour palette and smooth terrazzo surfaces lead to bright lime oak wall panelling, sheer curtains and vibrant plants, bringing the outdoors in. On the lush outdoor terrace, a series of intimate seating areas under pavilions or next to the pool provide guests with the opportunity to dine al-fresco, reminiscent of elegant Italian summers. A sunken group dining area provides a semi-private space for outdoor gatherings. When the sun sets, the hotel’s distinct, stand-alone social space comes to life. Annex, opening in late 2018, offers a unique, three-floor space to socialise. This societal gathering space allows guests to choose between a sophisticated al-fresco experience at the rooftop garden bar and a more refined social gathering space in the Den on the floor below. The interpretation of local heritage and native, natural materials continues throughout the guest rooms and residences of the hotel. Featuring a neutral palette and boasting sweeping views over the surrounding water, each room displays the 20th-century photographer Brett Weston’s masterful skill at manipulating photos of sand dunes to create sinuous lines and sensuous forms which references Abu Dhabi’s surrounding environment while remaining true to Edition’s sophisticated aesthetic. Grey oak herringbone timber flooring draws inspiration from local basket weaving techniques, whilst beautiful timber panelling adorn the walls, enhancing a feeling of calm and tranquillity. Signature imported linens are used throughout the guest rooms, whilst the bathrooms are finished in white marble, detailed in contrasting antique bronze. Guestroom balconies take in the beauty and serenity of the marina views and feature sleek, sophisticated outdoor furniture by Gandia Blasco. The property’s penthouses – the Marina Penthouse and the Royal Penthouse – are located on the “prow”, or point, of the hotel, reminiscent of the prow of a boat protruding out over the water. Both penthouses provide panoramic views over the water on two sides as well as from a large, private balcony. Each penthouse contains a large bedroom with six-fixture bath and soaking tub, whilst the lounge area contains a living room and dining area where meetings are conducted and guests are entertained. 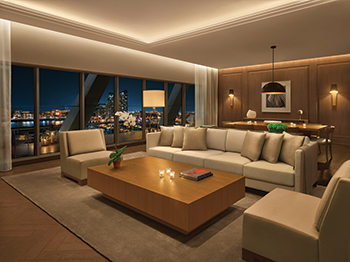 There is also an option to connect a single guest room to the public side of Marina or Royal Penthouse through an internal door, providing flexibility of accommodation for additional family members or personal assistants. For enhanced security and privacy, the penthouse suites also offer allocated parking spaces and a dedicated elevator to take guests discreetly to their penthouse without having to walk through the lobby. Penthouse guests can also access Market at Edition’s private dining room and the secure basement garage by private elevator. To provide privacy and a unique identity, the private residences are located in a structure adjacent to the hotel with their own dedicated entry and lobby. Connecting to the main hotel via the sky bridge, this six-storey building will enjoy views of the water and marina from each of the rooms. The private residences boast a living space of up to 92 sq m with separate bedrooms, lounge area and kitchen with their own service entries. The top two floors of the private residences are reserved for larger two- and three-bedroom apartments, each with a large private outdoor balcony and views overlooking the Marina. The hotel’s grand, elegant ballroom which measures an expansive 654 sq m with seating for 450 guests, can be accessed directly from both the hotel and the street. This private event space also houses a pre-function area with two bridal suites and a majlis as well as an executive boardroom, meeting rooms and business centre. Edition Spa at The Abu Dhabi Edition, opening shortly, features light oak flooring and timber walls that provide a soft, organic atmosphere. The spa has separate zones for men and women, consisting of seven treatment rooms including two hammams, a facial room and a couple’s treatment suite. The women’s area also houses a beauty salon and a relaxation lounge. The men’s area features a barbershop by Chaps & Co.
For fitness enthusiasts, The Abu Dhabi Edition offers two purpose-built gyms and two beautifully white-tiled swimming pools, one connecting to the main hotel and the other in the private residences.